Claws for Sale — Claw, Antler & Hide Co.
Claws have many different meanings but at Claw, Antler and Hide, we are focused on nature’s Swiss army knife. When you hear us discussing claws, we are talking about that curved pointed hooked nail on each digit. Claws are sharp and found at the end of a toe or finger in many mammals, birds, and some reptiles. And while we enjoy a nice seafood feast, we do NOT sell lobster claws just like we do NOT sell replicas or fakes. Claw, Antler and Hide Company sells the real deal. Our claws are collected and commonly used for creating necklaces, jewelry, utensils, weapons, keychains, apparel, decor accessories and crafts. Animal claws are the perfect souvenir and a great way to remember the black hills of South Dakota. Claws are necessary for survival in the wild and are perfect for digging, climbing and defense. Additionally, meat eating mammals like bears, bobcats, coyotes, foxes use their claws for attacking and holding their prey. 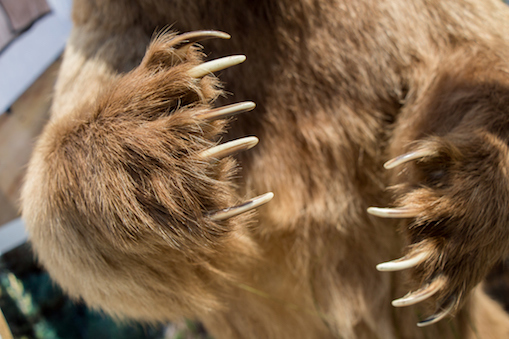 While claws are associated with the big cats, this useful tool is found in a range of species from bears to turtles to beavers. In fact, hundreds of species have claws. At Claw, Antler and Hide Company we sell single and claw sets. Additionally we represent numerous artisans that create beautiful keepsakes from claw jewelry to claw keychains and fur hats. Plus, throughout our Custer, SD store you’ll find mounts and other taxidermy with full claws, including large black bear mounts. At the end of the day, a claw is hard protein called keratin, a fibrous protein that is the main structural component of hair, feathers and horns. However, at Claw, Antler and Hide, we believe claws to be much more. In our hearts, claws symbolize a balance of body and mind. They are powerful symbols of a physical strength, confidence and pride. Looking for a specific animal claw or have more questions about claws? Call Claw, Antler and Hide Co. at 605-673-4345 or email us today.